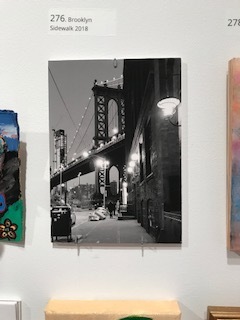 Woodstock, NY, is an artists’ town, and I’m thrilled to have photographs in the shows at both Woodstock Artists Association Museum and Woodstock Byrdcliffe Guild. If you’re doing a quick holiday upstate get-away from NYC, please check out these galleries in the heart of town. Wonderful art and wonderful art organizations. Please support the arts and artists this holiday season. Hope your season is filled with fun and joy. Woodstock Peony at WAAM above Marie-Claire Charba. My Woodstock Peony series, begun in 2017, is shot live in the garden as a response to our political reality in America. I wanted to make pictures that are undoubtably feminine. 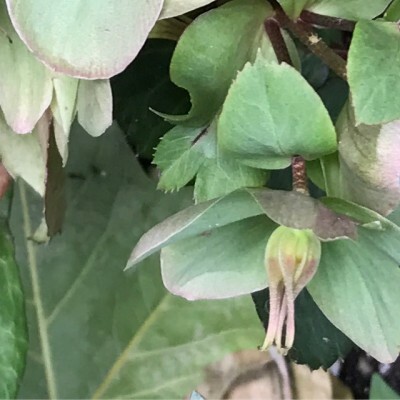 Each year the same plants yield very different flowers. Our political and natural climates are in distress, and sometimes the only thing I can do is turn to nature for solace. These pictures are both my response and my hope. The Byrdcliffe Guild’s famous 5 by 7 Show is going strong until the New Year. 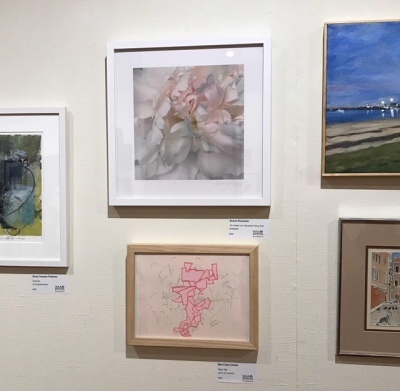 Hundreds of fabulous little pieces by local artists—all for 100 dollars. It’s a wonderful benefit, and I’m so happy to be part of this community and part of the show. Woodstock Bookfest. The Haiku Moment. 2019.
all day I miss them. So excited to offer The Haiku Moment, a mini-intensive workshop, at next year’s Woodstock Bookfest. 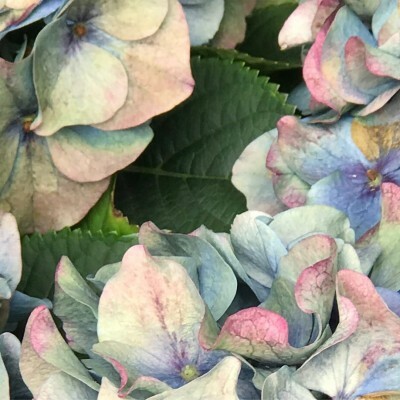 In this workshop, we explore not only writing haiku but also ways to incorporate haiku into a creative practice to inspire and guide other projects. I just wrote this haiku in Los Angeles, and it represents a snapshot, a moment in time, which can stand alone or lead to story. In a world where we’re all moving fast, haiku is a way to slow down, be where you are, and write the moment. Last year we had so much fun in this workshop. Come to beautiful Woodstock in March and join us for the Fest. The full schedule will be posted soon, so get on the Woodstock Bookfest mailing list and receive all the info. See you in Woodstock! As well as teaching a workshop, The Haiku Moment, at the Woodstock Bookfest, I’m so happy to be one of two contributing artists this year. Woodstock is a town of the arts, and the Bookfest brings readers and writers together in a landscape resplendent with both natural beauty and artists responding to and representing the natural world in their work. Woodstock Bookfest’s raffles offer local art to benefit the Fest. 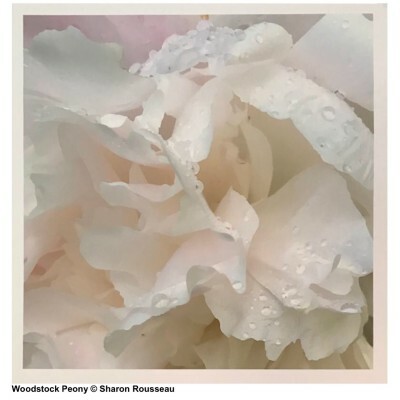 My photograph Woodstock Peony #3 will be awarded to the winner of a raffle to benefit the auction. Last spring, I photographed live flowers in the garden, trying to create images that held that held both flower and poem. Prints from the Woodstock Peony series are available through my contact form on this site. The wonderful artist, Kate McGloughlin, has contributed a monotype, Ashokan Cloudburst, IV. Info for both raffles in link below. Woodstock Bookfest Raffles: McGloughlin and Rousseau. I’m so excited about The Haiku Moment, a workshop I’ve created and am teaching at this year’s Woodstock Bookfest. While preparing for the event, I kept thinking about how to share not just the knowledge of what comprises haiku—the 17 syllables, the three lines—but the feeling that makes a poem a wonderful haiku. The poet, Marie Howe, describes it well here in the New York Times Poet’s Picks piece. I was thrilled that my poem was chosen in 2014, and, while I wasn’t thinking about this piece when I created the workshop, Howe’s description fits perfectly with my hopes for the day. 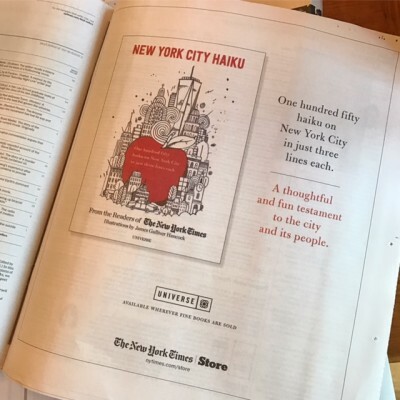 Marie Howe, the state poet of New York, reflects on writing haiku and The Times’s Haiku Challenge, which asked readers to submit a 17-syllable poem about New York City. A traditional haiku was attentive to time and place and most often referred to a season of the year. It was rooted in observations of the natural world and demanded an accuracy that refused romantic clichés. The language might be simple, the images taken from common life, but the insistence on time and place was crucial. 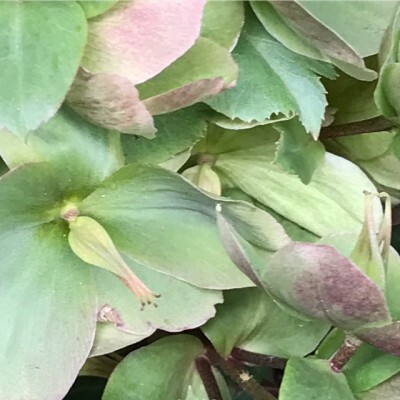 Many of the poems received did not find their inspiration in nature — most did not hold some implicit Buddhist insight about nature — elements essential to the traditional haiku form. These are New York City haiku. But the best of the poems we received had a quality of the right now-ness of actual experience — a moment that happens! And happens again as we encounter it in reading. The freshness and wit of the images held more than we could say. Yes, we thought, New York is like that. Like what? Like that. Yes. That. I could get there, right on time. But I’m still in bed. — Eugene Dunscomb, 83, Southbury, Conn. 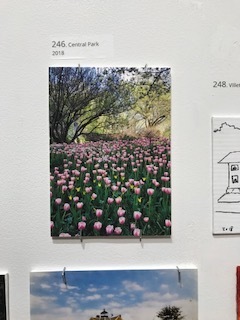 The Center for Photography Woodstock is celebrating its 40th Anniversary, and I’ve been asked to donate a Woodstock Peony print for the Benefit Auction and NYC Gala on Oct.12. Online bidding has begun at Paddle 8. Happy to be part of this auction with icons of photography. Thanks to everyone who is bidding! Today’s New York Times. 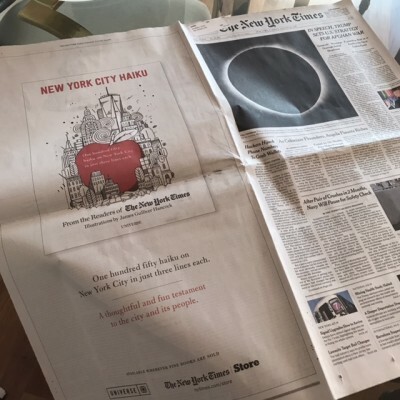 Our sweet New York City Haiku is full-page on the back of section A the day after the eclipse. Write poems, shoot for the moon. Woodstock Bookfest and I have teamed up for an end of summer haiku contest! 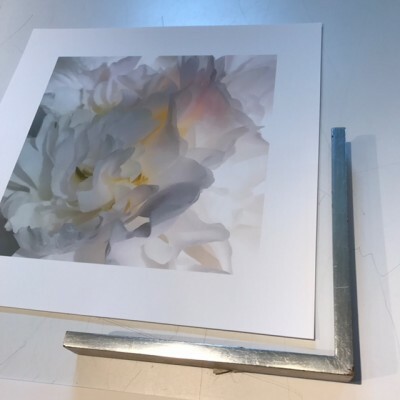 My custom print, Woodstock Peony, will be awarded to the winner. According to Martha Frankel, director of Woodstock Bookfest, this is how the idea came to her. The contest is open now until Sept. 14. The winner will be announced on Sept. 22. I hope you’ll write haiku on the theme of summer’s end and send it to us. Info HERE. 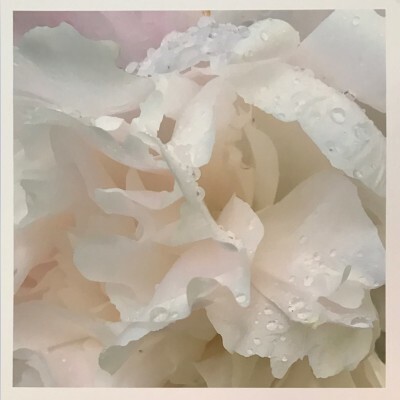 This spring when peonies bloomed, I began a series of photographs, From My Garden, inspired by the delicacy and translucence of the flowers. Spending part-time in the country is something I adore, but I’m no gardener. 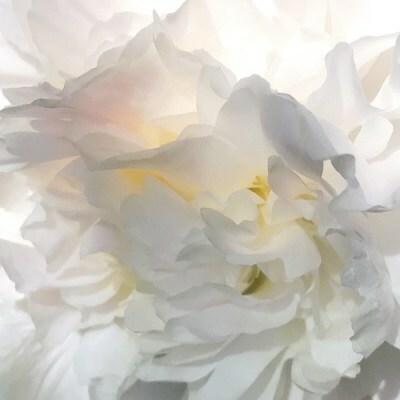 Somehow, though, the most exquisite peonies grow by my door, and several more small gardens, planted with my lack of expertise in mind, thrive around patios during the summer. With the flower series, I wanted to push the petals almost to abstraction, intimating brush strokes. 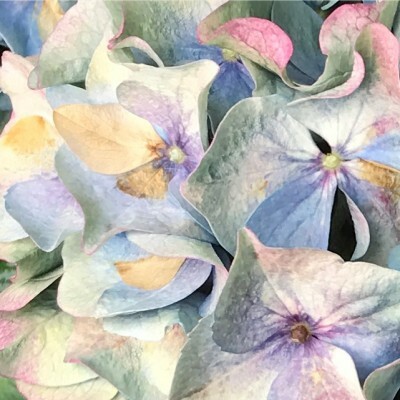 Throughout the summer, I worked printing the photographs, hoping to create the effect of painting with petals. It’s been a wonderful process. Custom prints are available now in 11 by 11 format. If interested, inquire through the contact form on this site. Fun With Framing Ideas at Woodstock Framing Gallery. 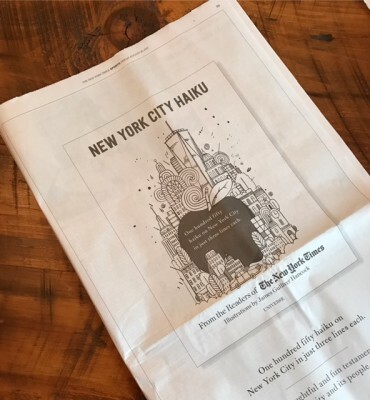 The New York Times still loves New York City Haiku five months after pub date! New York Times Sports. August 18,2017. New York Times Book Review. August 19,2017. New York City Haiku is available from The Golden Notebook and wherever fine books are sold. This week as I walked around the city, I paused at brownstone and building gardens to photograph flowers with my phone. Maybe I needed beauty more this week. And I found it. 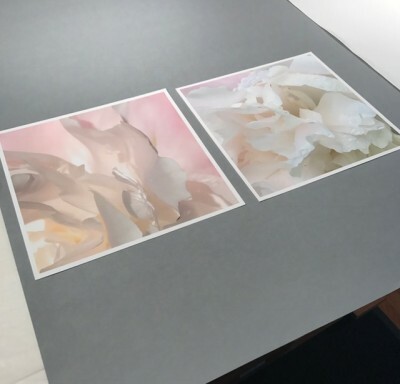 These images required no filters, and, from them, the idea for the peony series began.